For those of us who travel by air and have occasion to take our golf clubs there is a common lament, getting there is not half the fun. Aside from traffic and parking and cattle-call counter lines there’s the unpleasant fact you are transporting 40 pounds or so of dead weight which resists any kind of movement. The mere act of somehow lugging a golf bag filled with clubs (and maybe dirty laundry) from vehicle to check-in, whether curbside or inside, is something one could wish on their worst enemy — and don’t even get me started on the airline counter line shuffle a couple of feet forward periodically with suitcase, briefcase and golf bag. Sun Mountain however removed this hassle with the ClubGlider and its done much to alleviate air travel aggravation. Club carriers with two wheels had been around for some time but ClubGlider with four wheels really solved the transit problem—two wheel carriers just don’t. Twice recently I was very happy for the design. Returning a rental car and shuttle bussing back to the airport we found we had been deposited at the wrong terminal. So although we faced a long walk after clipping my briefcase and my companion’s carry-on to the ClubGlider all it was was a long walk which, on the positive side, gave us the opportunity to discuss the ineptitude of shuttle bus drivers. On another trip I f ound the resort front desk overwhelmed by people trying to check out and though I was able to check-in I was told there would be an indeterminate wait for a bell hop. This normally wouldn’t have been a problem, just go to the bar and relax, but an important business appointment, a.k.a. tee time, was rapidly approaching. Using the ClubGlider I got me, my suitcase and clubs easily to my room located two buildings away then just as easily rolled the clubs to the first tee. 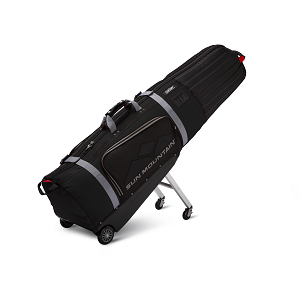 I also found after my clubs were on the cart the ClubGlider, which folds almost flat, could be stowed between the seat and the bag rack so I didn’t have to even store it albeit temporarily in the golf shop. 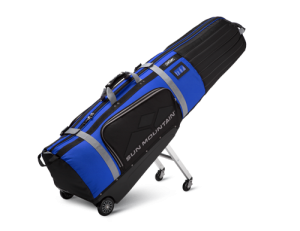 In addition to being impressed with ClubGlider’s obviously heavy duty construction I really liked the two large pockets, one on either side, which were perfect for shoes, extra golf balls, rain suit…and of course laundry. Plus there’s a side benefit of the four wheels I hadn’t realized until I actually used ClubGlider for the first time. Since the carrier is not lying flat on the ground but supported by the wheels, loading and unloading the bag is a much easier. Bottom line I can give a strong, no make that a very strong, recommendation to ClubGlider. 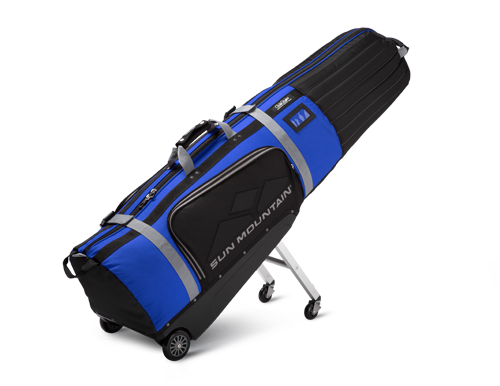 It solves the hassle of moving around with your clubs when you travel. Now if they could just do something about the line at the gate side Starbucks.